We came back last night after a quick trip to our son's property near Queenstown. I tried to get a bit of banding in but was not very successful. On Monday Haley come over from Dunedin and in a couple of hours we caught 1 lone Blackbird. After she had left on her journey home I left the nets up and caught a further 3 birds. 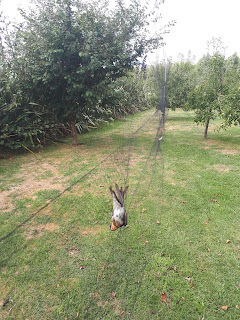 On Tuesday I had nets up for most of the day while I did chores around the property and caught another 3 birds. In all 4 new birds were caught and 3 recaptured but with 5 species at least there was a little bit of variety. The total included 2 new Blackbirds, 1 new and 1 recap Bellbird, 1 recap House Sparrow, a recap Chaffinch and a new Fantail, the first banded in over a year. The recap Bellbird was a female and the oldest female I have recaptured. The Chaffinch was originally banded on the first day of banding at this site, 12 Sept 2015 and is now the oldest bird recaptured of any species. The Fantail was a first year bird. After having to call off Thursday's planned session due to rain we had a go this morning with rather better conditions. It was a quiet morning with just 11 birds of 4 species caught, all except 2 House sparrows were new. There were 4 Silvereyes, 2 Blackbirds, 1 Greenfinch and 2 House Sparrows plus the recaps. The 2 recaps were both originally caught at the same net site nearly a year ago. I didn't take any photos today but here is one I have received from Rachel who trains with me down near Queenstown. 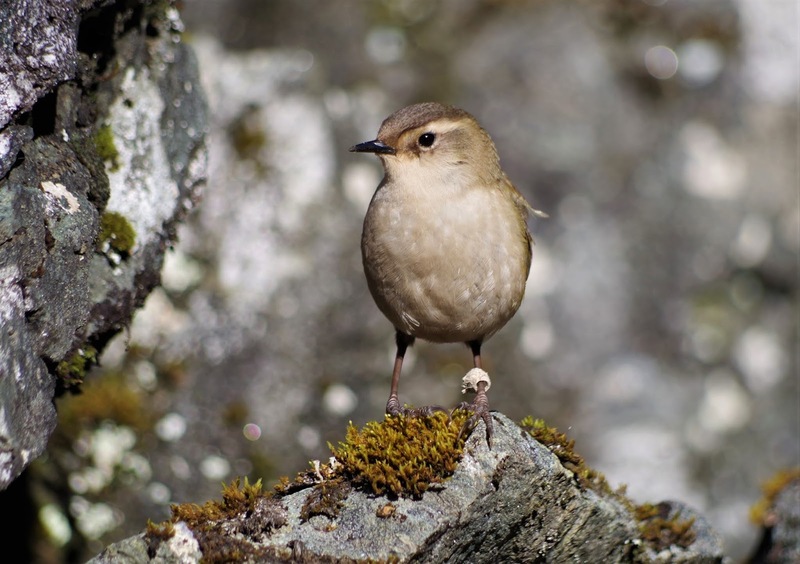 It is of a Rock Wren with a band like object around its leg. Apparently it is sloughed skin but I think it looks like a toilet roll put on the bird's leg by one of the little Elves who inhabit the rocky outcrops and who use the birds as transport!! 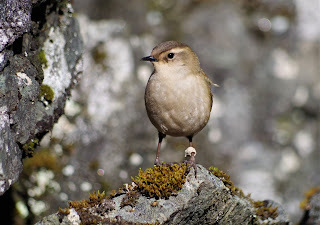 Female Rock Wren - Photo by Rachel Hufton. We had a session at the Quarry on Thursday morning catching 25 birds but with the catch dominated by two species there wasn't much variety. The day started out very promising with calm conditions and a good number of birds however the eastly kicked in and it became blustery and cold. With the wind increasing bird numbers dropped. All birds were new except a Chaffinch recap, this was the first bird caught and at 483 days from banding is the oldest caught of any species, exceeding the next oldest by over 100 days.The rest of the catch consisted of 12 House Sparrows and 11 Greenfinch plus a lone Silvereye which was the last bird caught. The Silvereye was interesting as its moult was not following the usual sequence and the two wings doing their own thing. Here is a couple of not very clear photos. Right wing with P9 half grown, P8 & 7 full grown and P6 still growing. Left wing with P9,8,7 all half grown with the rest finished. 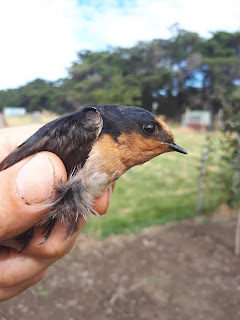 For the year 1 April 2018 to 31 March 2019 we had 23 sessions, banded 641 birds and made 74 recaptures at the Halswell Quarry. Most sessions were held on a Thursday morning. A few weekend sessions were held but these proved difficult due to many very unruly dogs and even more unruly owners. #8 Yellowhammer - 9 (1) including several juveniles that with a bit of imagination could be Cirl Buntings? # 14 Goldfinch 1 (0) another 5 were banded as Puli outside the Quarry. During the year two of our trainees progressed to Level 2 and most of the others are at, or close to that, level. I have just finished the returns for the Banding Office and have crunched the numbers for the Queenstown banding. Actually it is not really Queenstown the banding site is in Dalefield which is a rural area between Queenstown and Arrowtown. The total includes birds caught at the main site at my son's property on Littles Rd and at two sites nearby, Moorhill Rd and Thurlby Domain which are about 2km to the east and west respectively. We caught 943 new birds and made 300 recaptures of 16 species. This is slightly down on the last couple of years. The lower total is probably due to a number of reasons mostly weather related but also due to fewer banding days. # 1 Silvereye - 409 (158) was also No 1 last year. New birds higher due to birds caught at Thurlby Domain but recaps down. # 2 House Sparrows - 245 (67) also No 2 last year. Both new birds and recaps slightly down. # 3 Yellowhammer - 81 (4) the big mover for the year up from No 11 due to a large number of birds caught at the Moorhill Rd site. # 4 Chaffinch - 74 (12) pushed down from 3 by Yellowhammers. A big drop in numbers of both new and especially recaps from last year. # 5 Dunnock - 34 (18) was 6th last year but numbers slightly down. # 6 Bellbird - 19 (18) numbers down from last year. There were 16 males caught but only 3 females. # 7 Tui - 19 (13) same ranking as last year but numbers down. # 8 Goldfinch - 17 (0) very similar to last year. # 9 Blackbird - 11 (5) a big drop in numbers from last year when there were 33 (28) caught. Blackbirds seem to be fewer on the property, possibly due to there being fewer sheep and a lot of rain meaning the grass was longer and usually wet. No proof, just a theory. #10 Redpoll - 8 (1) a huge drop from the last few years mainly due to birds not coming to the stream with ample water available elsewhere. #11 Californian Quail - 8 (0) all caught in a net at the same time. Most have been seen at least a month after banding. # 12 Greenfinch - 7 (0) the lowest yearly total mainly due to smaller catches at the stream. # 13 Song Thrush - 6 (2) a low total probably due to the same reasons as Blackbird. # 14 Brown Creeper - 2 (1) the first caught. # 15 Starling - 2 (0) a lot about but with wet ground most feeding on nearby paddocks. # 17 Kingfisher - 0 (1) there have been a few calling but the one caught was about the only one seen. There were no Fantail caught for the first time in 3 years. We have been down at our son's place near Queenstown for nearly a week, back north Monday. Have endeavoured to do some banding while here but have been mainly unsuccesful due to a lack of birds. Rachel come over from Wanaka for a session on Thursday and Rebecca came from Te Anau today, Sunday. We managed to catch a few birds both days although they were mostly House Sparrows. I also had a couple of sessions down at the stream at the bottom of the property with limited success but at least had some variety. Rachel giving one of her Sparrows its bling. House Sparrow - 21 (5) included in the recaps was the oldest bird of any species recapturd here. Most of the Sparrows have nearly completed their moult. This young male is starting to show his true colours. Bellbird - 2 (1) All were caught at the stream and included a female which was good. I called in at the Moorhill Rd site for a look and found it deserted of birds. A Falcon has been visiting at least daily for several weeks for either a meal of small birds or a free range chicken. When I arrived the Falcon had just been chased away by the owner wielding a broom. There wasn't a bird of any description in sight. Phil continues banding at his place in Motukarara where he started banding last October after receiving his Level 2 permit. 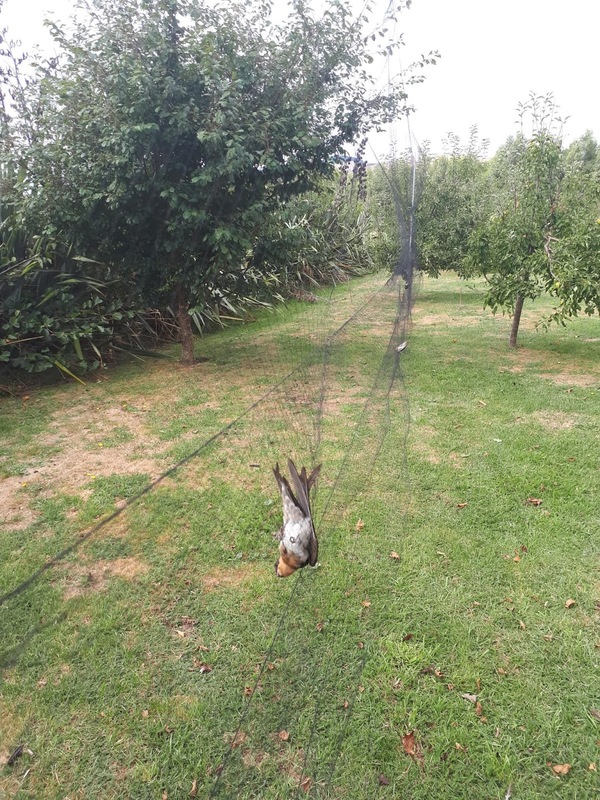 On Saturday he put a net up in his orchard and although he only caught 11 birds, there were some interesting ones. Silvereye, 3 new and a recap which had been banded on the first day of banding. Chaffinch 1 new and a recap which had been banded a week or so after banding started. House Sparrows 2 and the highlight was 3 new Welcome Swallows. He has now banded about 160 birds of 10 species. Starling - 26 a lot of these were nestlings from the many nest boxes he has on the property. Dunnock - 10 Phil believes he now has most of the resident birds banded. Chaffinch, Goldfinch & Blackbird - 5 of each.